Nauticam has been known to provide top-notch and high-quality underwater housings and this housing live up to their name. The Nauticam Panasonic Lumix S1/S1R Housing not only provides a durable and robust housing but also provides great ergonomics. The camera is very easy to operate thru the housing. It uses aircraft grade aluminum which would last a lifetime. Various ports are available to cater to all your shooting needs, may it be wide-angle or macro. 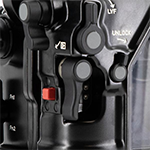 The housing uses the same port locking system as its Nauticam DSLR housings. There is no twisting or threading action that is required to mount a port, and it locks securely in place with this lever. Nauticam also offers locking port extensions, meaning a dome will never twist, even when used with a long extension ring. The housing locking latches are very easy to use and require very minimal hand strength to operate. It securely sets the housings back in place. It will also prevent any accidental opening of the housing which might compromise the seal integrity of the housing. Nauticam has been well known to provide housings with great ergonomics and well thought of button/lever placement. Buttons are very much accessible even though you are still holding on the handle. The housing is designed to support a wide variety of lenses which includes L Mount lenses jointly developed by Panasonic, Leica, and Sigma. The system also supports Sigma EF mount lenses attached by the MC-21 lens adapter. Flash Triggering - Optical flash triggering with automatic exposure is supported by the Panasonic DMW-FL70. For fast-fire manual flash triggering, the housing supports the Nauticam Mini Flash Trigger which uses small LED units to trigger external flashes via Nauticam Universal Fiber Optic Cables. A TTL Flash On/Off lever on the top of the housing allows for enabling or disabling the DMW-FL70 flash in the water. HDMI 2.0 Output - To take full advantage of the cameras video capabilities, the housing features an M28 bulkhead for HDMI 2.0 connections which can be used with various monitors such as Atomos Ninja V.
Vacuum Check and Leak Detection System - The housing comes with a pre-installed vacuum check and leak detection system. Combined with the Nauticam Vacuum Valve, this would provide a constant update on the housings seal integrity. A simple color-coded LED lighting system lets the user know that the vacuum is solid, or that the housing is losing vacuum. Leak detection is built into the same circuit, so if there is water intrusion, an audible and visual indication will occur. The Nauticam system is temperature compensated, eliminating false alarms caused by a change in outside temperature, or from a camera heating up on an action-packed dive. Read more about Get Excited for the Panasonic Lumix S Series!